Despite tighter regulations from the government, drones keep growing in popularity. We’ve seen a lot of amazing flying machines in the Consumer Electronics Conference held in Las Vegas. Here, some are new, just upgraded and others are models which we’ve previously known. In any case, below are the CES 2018 drones that you need to learn about. They are just what you might be looking for in case you wanted to buy one this year! Volocopter is taking 4K selfies and movies using drones is quite exciting. However, have you ever thought of using autonomous flying machines which can take two passengers from point A to B? Also introduced in CES 2018, Voloсopter is a product of the partnership between a German firm and Intel. It promises to offer some of the most internal computing features and perfect tech knowledge. Other features of this drone include 18 rotors and an impressive redundancy level if one is to fail. Although they are costly at the moment, once you go for a test flight, you’ll want to be part of this exciting experience. This fantastic drone was first introduced in 2016 as just a Kickstarter project. But according to Noosphere instigator Max Polyakov, we got a chance of viewing its successor at CES 2018. The model comes with features such as flight time, a camera and an excellent field of view. What’s more, you can find all these components in a tight shell that can even fit in the palm of your hands. 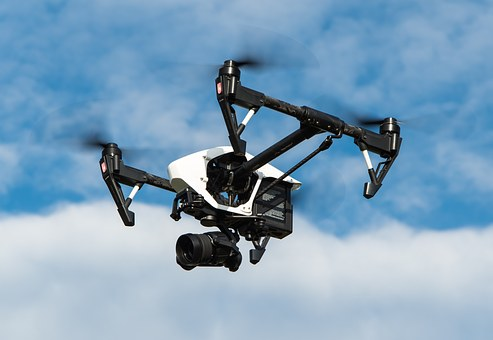 It’s also run by a mobile phone application and various other features that you wouldn’t get in any other drone, for instance, the unique ability to hover on a single spot. Therefore, its main purpose is staying up in the air long enough to take some selfies. Other than that, it’s also used to just buzz around like any other drone, making videos and photos with an incredible 12mp camera. Lastly, it comes with a 16GB inbuilt storage system! Do drones necessarily have to fly? Well, not really, says the owners of PowerDolphin. The company now has a drone that can move across the water surface taking clips and pictures of your favourite lake or pond! Besides, it delivers lifebelts to a struggling swimmer and because of its sonar scanning feature; it maps out the surface of the water below. The drone can also detect fish from around 40 meters or 131 feet. It then releases a bait and line to capture them, giving you a hands-free fishing experience. With Tello, you get a whole bunch of features. First of all, it’s a Chinese made drone that uses technology from DJI and Intel. Here, you get 360-degree Camera, flight stabilization and live streaming capabilities. The best feature of this device is the simple control system that makes it perfect for youngsters. It offers close to 13 minutes of ample flight between charges, takes beautiful 5MP videos and snaps, and has weights about 2.8 ounces or 80 grams! As you can see, the continued growth in the creation of drones only shows the shocking improvement in the world of software and tech devices. Just like Artificial Intelligence, it’s another fantastic glimpse into the future! So, from this list of drones, which one do you think suits you best?